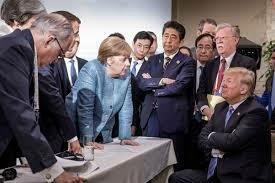 But he came alive whenever trade was mentioned, mocking and insulting other leaders, particularly Mr. Trudeau, Mr. Macron and Chancellor Angela Merkel of Germany, according to the witnesses. [Translation: The teen ager felt he had to assert himself sometime.] Ms. Merkel was clearly not happy but largely kept quiet, evidently not wanting to provoke more conflict. 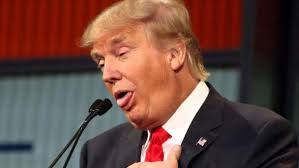 Mr. Trump’s conversation was described by European officials as stream of consciousness, filled with superlatives but not following a linear argument.” [Translation: “Stream of consciousness” means he’s incapable of organizing any thoughts; “filled with superlatives” means with his limited vocabulary, all he can do is repeat strong sounding words; “not following a linear argument” means it made no sense whatsoever. ‘“I may be wrong. I mean, I may stand before you in six months and say, ‘Hey, I was wrong.’” He paused a moment, realizing how out of character that would be. On a more serious side, we should be asking whether the romancing of North Korea is part of a plan to clear the decks in order to attack Iran.